The Cal Poly Lambda Chi Alpha chapter on Saturday in front of their fraternity house. This photo is at the center of social media outrage over alleged racism. The photo was shared on social media and confirmed as taken Saturday by fraternity officials. 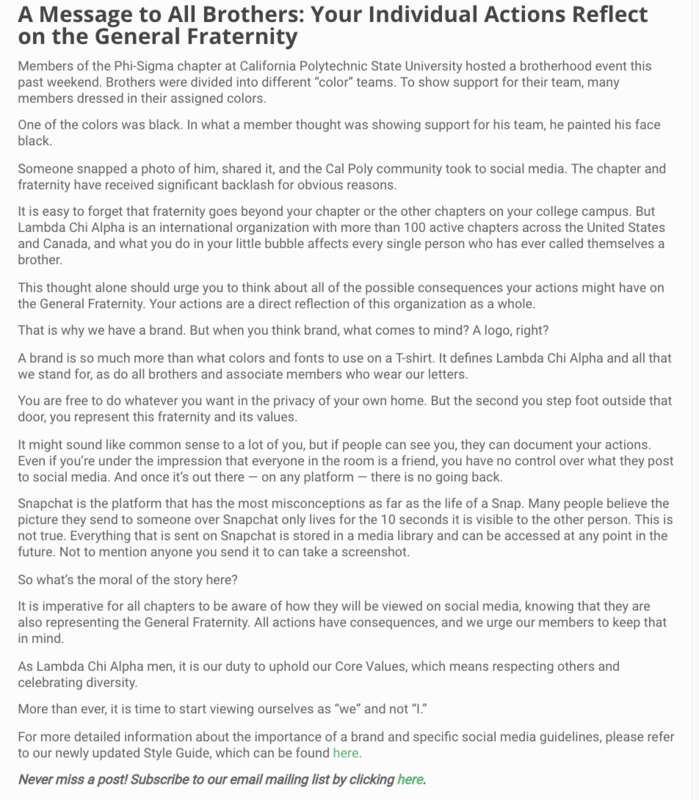 UPDATE 04/09/18 7 PM: Cal Poly's dean of students announced Monday afternoon the Lambda Chi Alpha fraternity has been placed on 'interim suspension' while Cal Poly continues its investigation. According to the university, interim suspension suspends university recognition and requires a fraternity chapter to suspend all functions, events and activities. UPDATE 04/09/18 1 PM: Lambda Chi Alpha has removed all references to black face paint or "different color teams" from their official statement to members and alumni (original below). UPDATE 04/09/18 11 AM: Lambda Chi Alpha's International Headquarters released a statement to current members and alumni in their Cross & Crescent publication titled: A Message to All Brothers: Your Individual Actions Reflect on the General Fraternity. The message from Lambda Chi Alpha mirrored the statement sent out by the local chapter Sunday, saying the members were dressed in colors to support their teams. There was no acknowledgment of the photo of the members in stereotypical gang wear. But when you think brand, what comes to mind? A logo, right? A brand is so much more than what colors and fonts to use on a T-shirt. It defines Lambda Chi Alpha and all that we stand for, as do all brothers and associate members who wear our letters. You are free to do whatever you want in the privacy of your own home. But the second you step foot outside that door, you represent this fraternity and its values. It might sound like common sense to a lot of you, but if people can see you, they can document your actions. Even if you’re under the impression that everyone in the room is a friend, you have no control over what they post to social media. And once it’s out there — on any platform — there is no going back. The statement said "all actions have consequences, and we urge our members to keep that in mind." UPDATE 04/09/18 9 AM: Cal Poly spokesperson Matt Lazier said the university has no additional comment at this time. UPDATE 04/08/18 9 PM: KCBX News received a photo from Saturday's Lambda Chi Alpha party that shows fraternity members dressed differently than they initially explained in their apology. 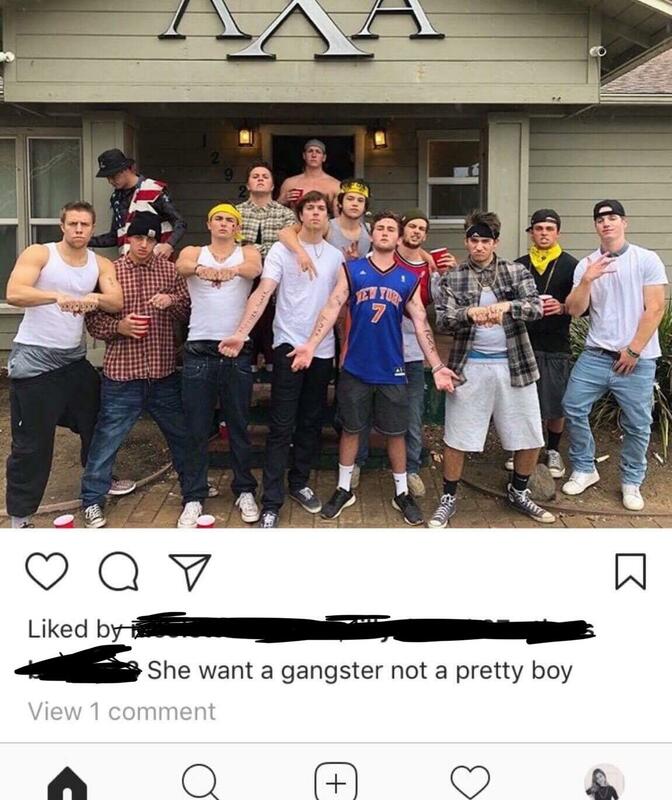 The caption reads: "She want a gangster not a pretty boy," with members dressed in various stereotypes of urban gangster wear, which includes sagging pants, fake prison tattoos, and gang signs. The photo was published by an Instagram user who has "Cal Poly '21" and the Greek letters "ΛΧΑ" in his profile. The original statement from the Lambda Chi Alpha International Headquarters. The statement was later edited to remove references to black face paint or "different color teams." The fraternity is not currently returning requests for comment. A spokesperson for the university said he had not been made aware of the photo and the university won't have a response until Monday morning. 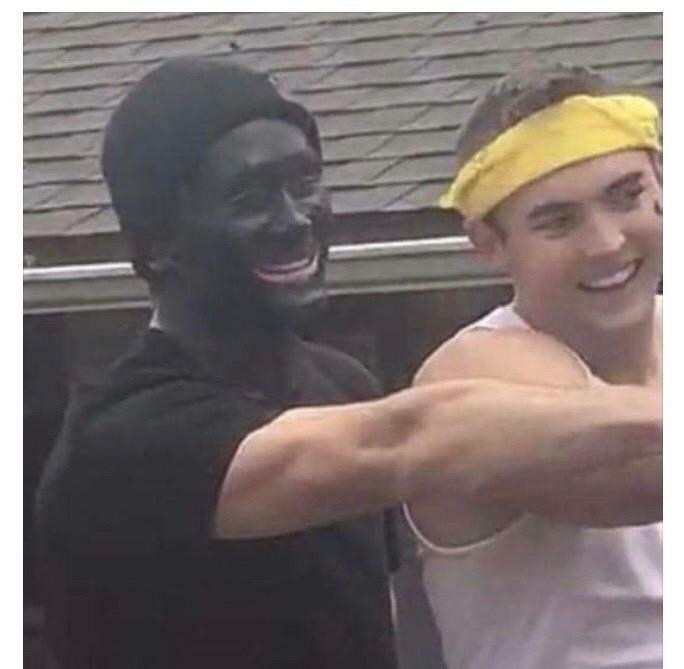 In the first photo shown to KCBX on Sunday, a member of the Cal Poly fraternity Lambda Chi Alpha is shown smiling with his face covered in black paint. According to Logan Boersma, president of the Cal Poly Lambda Chi Alpha chapter, the event was a “brotherhood event,” closed to the public and only for Lambda Chi Alpha members. This Instagram post was sent to KCBX late Sunday night. A witness to the event, who requested anonymity, said 60 to 70 people attended the all-day Saturday event, dressing in costumes, playing drinking games, and listening to music at the Lambda Chi Alpha house on Foothill Boulevard, near the Cal Poly campus in San Luis Obispo. Boersma, who was at the party, said the “brotherhood” was an event featuring six teams based on “families,” and that they all dressed in different colors and costumes. Boersma said the face paint and colors weren’t meant to represent any race or ethnicity. He also said he has spoken with university administration on the matter. We are extremely sorry and embarrassed for failing to recognize the racial impacts this brought forth. The representation depicted in the photograph was absolutely unacceptable by our standards as it had a negative influence on surrounding members of our community. Although it was not our intention to stir up racial tension, we understand the negative impact this picture had on our peers. We are currently working with our local community to amend the discrepancies this photo has caused. Lazier later added that the Dean of Students, Kathleen McMahon, is involved in the investigation. 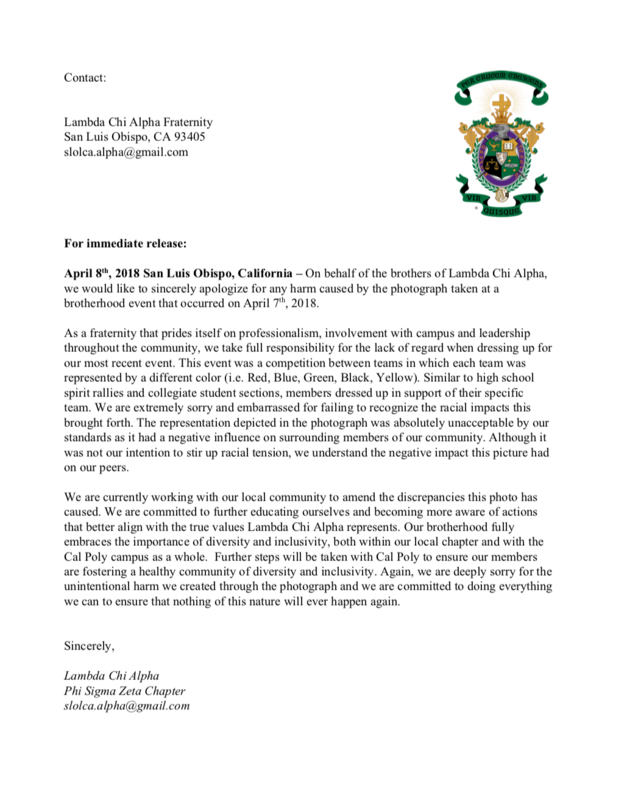 Letter sent out by the San Luis Obispo Lambda Chi Alpha chapter on Sunday afternoon. This isn’t the first time a Cal Poly Greek organization has been publicly accused of being racially insensitive. In 2013, a Phi Sigma Kappa fraternity chapter had a 'Colonial Bros and Nava-Hos' party, which prompted a Cal Poly investigation after complaints the theme was offensive to Native Americans and women. Cal Poly President Jeffrey Armstrong later denounced the party.